Burlington artists against the proposed Champlain Parkway organized a tug-of-war at the South End Art Hop earlier this month. They invited supporters of the roadway designed to improve the city's Pine Street corridor to meet up with opponents to pull for their respective points of view. A crowd assembled, but a problem arose. Plenty of people lined up against the project, but "there wasn't anybody on the other side," said Amey Radcliffe, a graphic artist who helped organize the event. The opponents sent a few volunteers over to the "pro" parkway side and easily overpowered them in the tug-of-war. The stunt perfectly illustrated what Radcliffe wants to say about the proposed connector road that has been on the drawing board since the 1960s and recently cleared final approval hurdles: "Where is the public support for it?" she asks. Earlier that day, the artists claimed a separate but related victory in the same commercial district, which is known in "planning speak" as the South End enterprise zone. Burlington Mayor Miro Weinberger announced he would abandon plans to put housing there — a proposed zoning change that artists feared would price them out of their funky studios in repurposed industrial buildings. Satirical Art Hop works critical of the mayor — including a cardboard "Miroville!" development — appeared to have achieved their goal. Inspired by their success, many artists are now hoping to turn their agitprop and growing political savvy on a new cause: to block the parkway. But it's unclear whether the artist-activists will be able to stop the decades-old project, which has the mayor's solid support. The road won a major permitting battle in August when the Vermont Supreme Court beat back an appeal of the parkway's state environmental permit, which was granted in 2014. Compared to the housing proposals for the South End, the parkway is "a lot further along. It has been approved," Radcliffe said. She and other artists are hoping that by asking questions they will help inspire new thinking about the parkway. They plan to attend an upcoming meeting on the project that the city is organizing this fall — no date has been set — and perhaps use petitions, more art and other tools to rally public opinion. Diane Gayer, a South End architect, planner and artist, said the parkway is an obsolete proposal that wins support from public officials partly because it's been planned for so long — and there are federal dollars attached to it. The 2.8-mile parkway was first proposed in the mid-1960s as a four-lane highway that would speed cars from Interstate 189 at the southern gateway of Burlington to downtown. After curving to the west around Shelburne Road and Pine Street, the highway was supposed to run parallel to Pine over the Barge Canal and dump cars onto Battery Street. A portion of the project was paved in the 1980s from I-189 — the connector to Interstate 89 — to Home Avenue. But it never opened to traffic. Since then, the dead-end stub of highway has been known colloquially as the Road to Nowhere, and the proposed route has changed. It would no longer run over the capped Barge Canal Superfund site due to environmental concerns about disturbing polluted soils there. Instead, it would go to Lakeside Avenue, then jog east to Pine Street. Weinberger remains committed to the parkway. He showed no sign of backing down in a telephone interview one week after the Art Hop — despite numerous public displays against him. In addition to the tug-of-war, the event featured various installations that bashed Weinberger's pro-development policies. An oversize pink papier-mâché confection called "Miro's Farmhouse Lopsided Sugar-Coated Plan BTV Cake" bore a sign explaining that artists would get "some crumbs" from the cake and a free serving of the "Champlain/Champagne Parkway." Another artwork featured Weinberger as a puppeteer perched on an art studio roof, manipulating the suspended figures of the city's planning and zoning director, David White, and Burlington City Arts director Doreen Kraft. Weinberger did not seem provoked by these jabs. He said he appreciated and respected the voices of artists and their participation in the public process. But that doesn't mean he's caving on the parkway. "I don't see the city changing course in this policy direction," Weinberger said firmly. He said he believes the parkway will help traffic flow, improve pedestrian and bicyclist access, and get heavy truck traffic off Flynn Avenue and other streets. 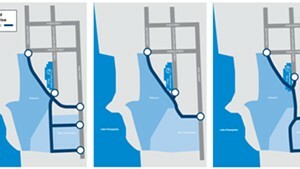 The city council unanimously approved the project in 2012. 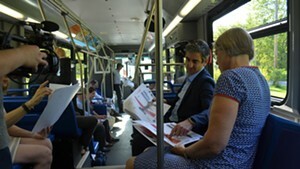 Since then, Weinberger said, his administration has worked diligently to improve the design of the parkway. It's not the four-lane divided highway that would have enabled motorists to barrel through the city, separating neighborhoods from Lake Champlain and each other, he said. "You're never going to have 100 percent of people agreeing about a major transportation decision like this," Weinberger added. The earliest the city could start construction is 2018, Burlington officials say. It would cost an estimated $30 million on top of the $8 million spent since 1998, and the millions more that went into planning, design, property acquisition and legal expenses before that. In advance of construction, the city needs to acquire temporary and permanent rights of way to at least 26 parcels along the proposed pathway, according to Chapin Spencer, director of public works. While some of the easements will likely be minor, it's possible that landowners could balk at ceding even small rights of way and force the city into more legal battles to take the land through condemnation. Everyone seems to agree that current traffic on Pine Street, especially at the intersection with Maple Street, is a mess. About 16,000 cars a day travel the corridor. The parkway would take some traffic off the southern end of Pine, but add an estimated 1,800 cars to the congested stretch between Lakeside Avenue and Maple, where cars back up for blocks to get through the four-way stop. Some trucks can't manage to turn east or west at that intersection. The prospect of more cars being funneled into this dysfunctional junction is one of the major criticisms of the parkway. Weinberger and Spencer say new traffic signals would improve the Maple-Pine clog. 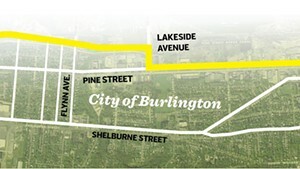 The duo also hopes that in the long term the city will build a short road that would jog west from Pine near Kilburn Street, cut behind old industrial buildings on South Champlain Street and run along railroad tracks to connect to the south end of Battery Street — allowing a bypass to the Maple-Pine junction. But that would require a separate permit process, many studies and possible hurdles involving soil contamination in the Burlington rail yard. Critics wonder what the parkway will accomplish. "I think there are ways to improve traffic flow without building the highway," said Marc Leone, who has a front-row seat to the problem from the business he co-owns, Sterling Hardwoods, at 422 Pine Street. Rush-hour traffic backs up a halfmile or more every day, he said. Had the parkway been built 30 years ago, it would have been useful, but now the city has grown up around the route, and it's going to hurt more neighborhoods than it helps, according to Leone. "I just don't trust them to fix the problem and add more vehicles at the same time," he said. It would be great to get more people out of their cars, Leone said, and he's heartened to see more people walking, riding bicycles and even jogging to work outside his shop door. Shortly before 8 a.m. last Friday, commuter traffic heading into the city's South End whined as cars and trucks exited from I-189 and made their way toward downtown on Shelburne Road, South Winooski, South Willard and Pine. But it was quiet along the roughly paved portion of the parkway that is already built — off Home Avenue. It's a weirdly untraveled corridor in a bust-ling little city. Not a single vehicle was visible. Weeds poked through cracks. Birds sang and poplars, maples, pines and sumac crowded the edge of the concrete. An abandoned mattress lay on the pavement, and bushy plants grew all over a median between the marked lanes. Stretches of handsome granite curbing ran along the unfinished road. 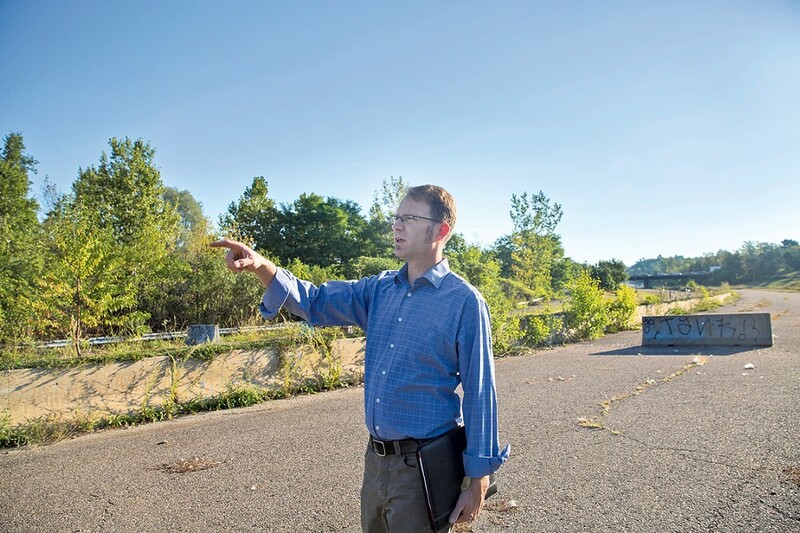 It took about 10 minutes for Spencer to walk from Queen City Park Road to where the pavement connects to I-189 and an eight-acre bowl-like area. If not used for the parkway, could this parcel host something else — such as new neighborhoods with houses, apartments, offices and stores? Even if the city wanted to abandon the parkway and build something on the land, it would face hurdles, Spencer said. "This is not the city's land free and clear to do what it wants with it." The parkway has been a state and federal project, and the city would have to repay the state an estimated $8 million, if not more, to reclaim the land for other uses, Spencer said. That's a lot more than the estimated $600,000 the city has to kick in to see the $30 million parkway completed. The federal government is on the hook to cover the vast majority; the State of Vermont, the rest. Spencer, meanwhile, insists the parkway has merit. It will be a low-speed artery with well-designed crossings and room for bicyclists and pedestrians when it's built, said the former full-time advocate of alternative transportation. "We are continually working to evolve this design and make it a street that fits into the character of the South End," he said. Skeptics are going to be surprised, Spencer suggested. He thinks the parkway will be built. "People are always saying it's not going to happen," Spencer said. "Well, we are closer than we've ever been, and there is a path to construction at this point."